It has always been said #1 on Google is very important, but how important? There have been studies done over the years that show the click through rate of being #1. Some websites I have owned have seen click through rates for the #1 spot as high as 70%. Just comes down to the actual keyword and the type of traffic. 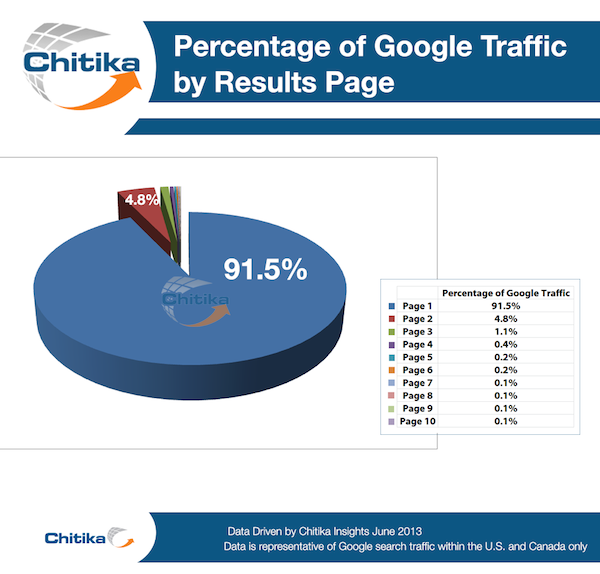 Chitika is an advertising network that actually works very well on content websites. I used them on some websites and they did increase revenue while using Google Adsense. They ran a new study and below is some interesting information. Here is a link to the actual study if you want to read it. The quick results are 33% of traffic click on the #1 position, then decreasing to 18% and of course it only goes down from there. These types of studies show how important #1 on Google is and why so many companies, small and large, put a lot of time and effort behind their SEO strategies. It could mean double the revenue or leads just by moving up to the #1 spot. There has been such a huge shift over the years to reach the top of Google and Google has also made huge changes on their end to stop black hat SEO strategies. As I like to say, SEO is a chess game and may the best strategist win. After page 1 Google, there is an obvious drop off for page 2 Google. 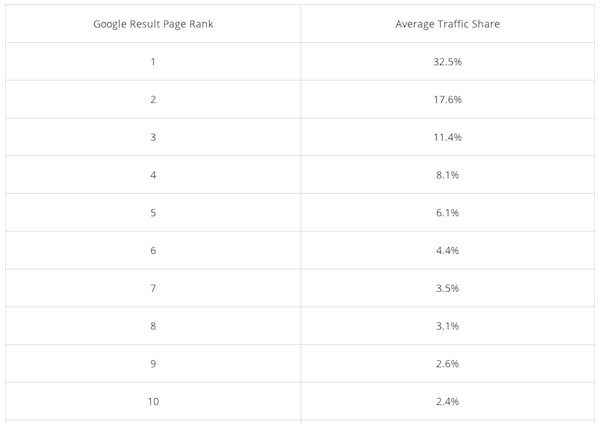 I feel you need to be in top 3 in order to get any real traffic, but only 8% even go to page 2 Google. I will say though, the 8% that go to page 2 are probably serious buyers or researchers if they are going that far into the rankings. The top of each page does see the most traffic, so even if you are on page 2, at least shoot for the top spot to get the most traffic possible. Yes, it wont be much, but it is better than nothing. The rest of the pages click through rate are… Pages 2, 3 and 4, traffic dropped by 27%, 11.3% and 5.4% respectively from #1 to #2. This is an overall average on tens of millions of online ad impressions, so there will be a difference in click through rates depending on the keyword and industry you are in. 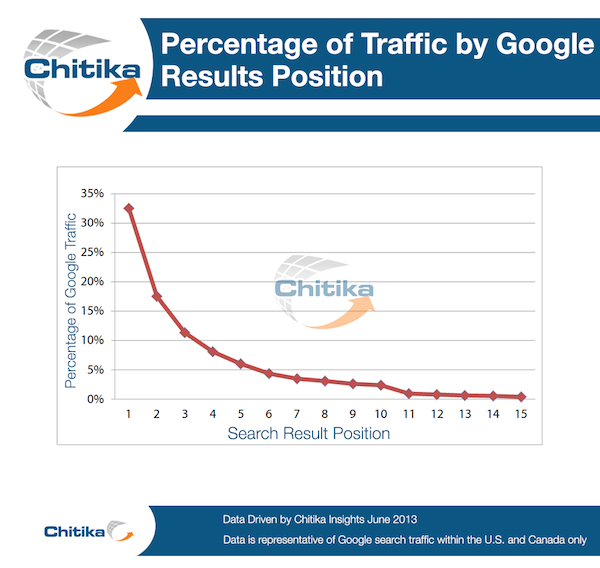 All traffic in this study was from Google, but you have to expect similar numbers on all search engines. You can download a full report on this study here. Where you rank on Google has everything to do with your SEO success. There is no way around it. 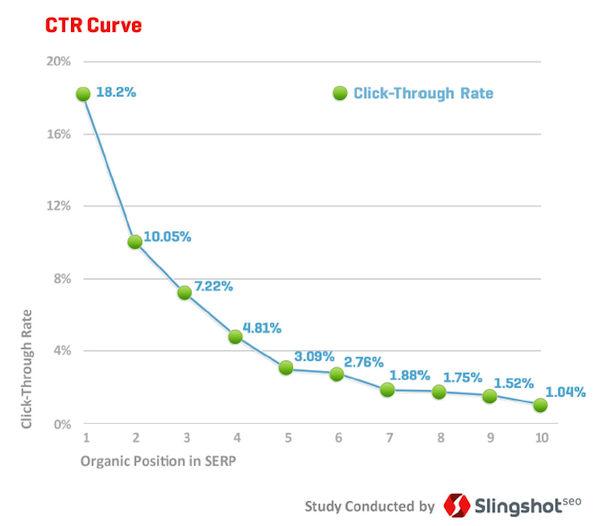 The higher position always wins in the amount of click through rate you receive. One other thing that has been proven is, when you have an ad on the same page where you show up organically, you do get an increase in click through. Also, when you have video on the first page Google, that will also get a higher click through rate since video engages people more. Plus, video is much easier to reach page 1 Google, so you should incorporate video into your SEO strategy. A 2011 study by Slingshot SEO showed the No. 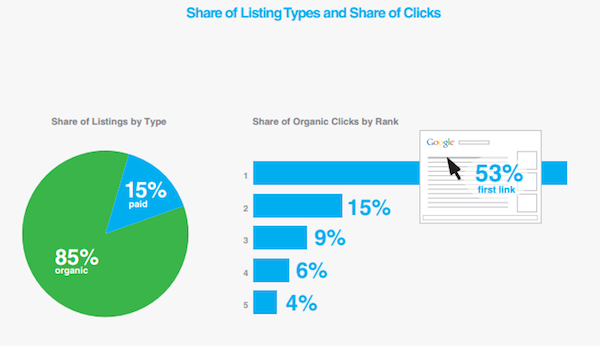 1 organic position in Google received 18.2 percent of clicks, with the second position at 10.05 percent and the third at 7.22 percent. The company that dominates SEO is the company that wins. Take AJMadison.com, they do very very well in their organic SEO as they dominate their market. That equals sales for them, as they are in a very competitive industry and sell products that most do not like to buy online. Just be careful that you do not cross the line into the black hat SEO world because you eventually will get slapped by Google. I guess you can say its like lying to your parents, they always seem to find out.